Air conditioning inverter operating off 72 Vdc batteries. 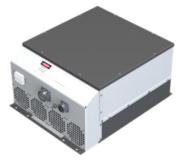 DC:DC converter plus one 3-phase inverter for the compressor and one single phase inverter for blowers and control system. 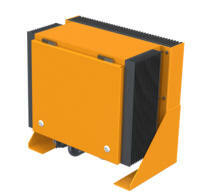 The product is available with two 3-phase inverters or one larger inverter without separation of the air con system. 6kW 220 amp and 8kW 300 amp battery chargers supplied to China North Rail. Pilbara Rail/Hamersley Iron locomotives are built by GE Transportation in the USA and are then shipped to Australia to be used in the mining industry. Single phase inverters are installed to provide 240 Vac 50 Hz power to the driver’s cab where it is used for standard appliances such as a kettle, typical microwave oven and other devices. Hunter Valley DMUs were built by United Group Rail in Broadmeadow, NSW. These trains run as a 2-car consist and each car has a pair of battery chargers installed in the roof. An on-board generator provides 415 Vac three phase power to the battery chargers and this is converted to DC. The battery charging current and voltage are measured and fed back to the battery chargers in order to control the charging of the batteries and also supply the standing load on the battery bus. The battery chargers use an optimum charging algorithm of constant current, constant voltage and trickle charge modes. Each pair of battery chargers share the load and are able to take over the over the full load if the other fails. Maximum output current is 500 amps at 27.6Vdc. VLocity DMUs were built by Bombardier in Dandenong, VIC. These trains run as 2 or 3 car consists and each car has a battery charger installed in a locker. An on-board generator provides 415 Vac three phase power to the battery chargers and this is converted to DC. The battery chargers maintain a float voltage of 27.6Vdc on the battery bus which charges the batteries and also provides power to the standing loads. Maximum current for this battery charger is 220 amps. RailCorp maintain a fleet of Xplorer and Endeavour DMUs for use in outer metropolitan and regional areas of NSW. These trains run as 2 or 3 car consists and each car has a battery charger installed in a locker. An on-board generator provides 415 Vac three phase power to the battery chargers and this is converted to DC. The battery chargers maintain a float voltage of 27.6Vdc on the battery bus which charges the batteries and also provides power to the standing loads. Maximum current for this battery charger is 150 amps. Several Pacific National 80 Class locomotives have undergone refurbishment. The two air conditioners serving each cab have been replaced by one split system. Power systems have been installed in the air conditioning system to provide power and control. The 74Vdc locomotive battery power is converted to 600Vdc which is then used by two inverters to control the speed of the compressor and provide power to each evaporator. The Pacific National 81 Class locomotives have side-mounted all-in-one airconditioning systems that can be installed or removed via forklifts. Power systems have been installed in the air conditioning systems to provide power and control. The 74Vdc locomotive battery power is converted to 600Vdc which is then used by two inverters to control the speed of the compressor and provide power to the evaporator fan. MTR in Hong Kong use maintenance wagons to perform work on overhead lines on their network. The maintenance is performed at night in underground tunnels where diesel generators cannot be used. Converter sets are installed on the maintenance wagons to provide single phase or three phase power from 280 V battery banks. During the day back at the depot, the battery charger is used to recharge the batteries ready for another maintenance shift. The 2800 Class locomotives are owned and operated by Queensland Rail. These locomotives have side-mounted all-in-one air conditioning systems that can be installed or removed via forklifts. Power systems have been installed in the air conditioning systems to provide power and control. The 74Vdc locomotive battery power is converted to 600Vdc which is then used by two three-phase inverters to control the speed of the compressor and provide power to the evaporator and control systems. Cairo Metro use three phase inverters as frequency converters. The input power is 250 Hz which is too fast for the on-board fan motors. The power is rectified and then inverted at 50 Hz which then can be used to drive the fan motors. The NR Class locomotives are used for freight and long-distance passenger services on main lines throughout Australia. For the driver’s cab, single phase inverters are used to provide 240 Vac 50 Hz power which can be used for standard appliances such as a kettle, hotplate, and a typical microwave oven. This provides the crew with creature comforts on long journeys. The roof-mounted air-conditioning system contains a DCformer unit which converts the incoming 74Vdc to 600Vdc which is used by the air-conditioning inverters and control system. A DC-DC converter is installed in the braking control system. The Chicago Freight Car Leasing Australia VL Class Locomotives are built by AVTEQ in Melbourne, VIC. The air-conditioning system that serves the driver’s cab is powered by a DC former and three phase inverter. The DCformer converts the incoming 74Vdc from the locomotive battery bus to 600Vdc. This is used by the three phase inverter to power the compressor of the air-conditioner. MTR and KCRC Hong Kong had a requirement for inverters for ventilation fans. These were to supply power to the emergency fans whilst passengers were evacuating. The frequency of the inverters would slow as the voltage of the batteries dropped. RailCorp Tangaras were fitted with inverters for the emergency ventilation system. Three phase inverters were used to convert 110Vdc to 70Vac at 20 Hz. This provided power for the ventilation fans in emergency situations as passengers evacuated.